The rumours are so persistent that they are getting quite difficult to ignore: Ayad Allawi, leader of the Wifaq movement and the Iraqiyya coalition – the most sizeable, enduring and electorally successful secularist entities in post-2003 Iraq – keeps spending time talking to Ammar al-Hakim and other leaders of the newly (re)formed, Islamist and Shiite-dominated Iraqi National Alliance with a view to possibly joining their ticket for the upcoming 2010 parliamentary elections. Or rather his lieutenants in Baghdad keep these discussions going; Allawi himself has actually spent parts of Ramadan in the United States. Some Iraq watchers are likely to construe any such alliance as a wonderful sign of progress in Iraqi politics. Is it not great that Allawi, a secularist, can get together with Shiite Islamists in a businesslike manner? Is this not proof that sectarianism is on the decline, since Allawi, whilst himself a Shiite, is popular among many secular Sunnis as well? Alas, no. Political maturation requires a little bit more than people of different backgrounds getting together on the same coalition list. In particular, it would be nice, especially for voters, if the components of that kind of list had a minimum of ideological coherence and common issues on which they agreed. But unfortunately, such coherence is in short supply when it comes to the Iraqi National Alliance. Already, there is pronounced tension between the two main components, the Sadrists and the Islamic Supreme Council of Iraq. 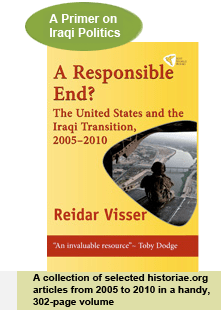 The former subscribes to the vision of a strong, centralised Iraqi state; the latter has been the main protagonist of the decentralisation in Iraq and giving concessions to the Kurds. Where the two agree is with regard to the need to Islamise Iraqi society, as seen for example in Basra where Sadrists and ISCI figures have been trying to outbid each other in imposing Islamic dress codes and Islamic behaviour. Also, they are unified in their desire to keep Iraq free of Baathists and what is described as remnants of the old regime more generally. In fact, this is probably the single issue where there seems to be perfect agreement inside the alliance: Among the few specific points offered in its programme is a promise to voters to “cleanse the institutions of the state of Baathist and Saddamist elements”. This anti-Baathism was the unifying theme in the previous Shiite alliance (the United Iraqi Alliance or UIA), and ISCI preacher Sadr al-Din al-Qabbanji – the figure who communicates with the popular base of the party – has promised that it will be central to the new alliance as the 2010 elections approach. And so it seems clear that to add Allawi to this mix would turn things into a complete parody. In fact, such is the antipathy towards Allawi (himself a former Baathist) in the core electorate of the Shiite coalition that the first UIA elections poster featured pictures of him as well as Hazim al-Shaalan with the text “the Baath is coming back – will you allow it?” In other words, it was believed that dislike of Allawi would be the best way to mobilise UIA voters. Remove the anti-Baathism issue and it becomes incredibly difficult to define what the Iraqi National Alliance really stands for. That exposes the only remaining glue in the Shiite-led alliance: thirst for power, without the slightest regard to ideology. Over the past weeks, the alliance has signalled readiness to include anyone who is willing to sign up, including other past foes like Wail Abd al-Latif from Basra who antagonised ISCI with his drive to make Basra a standalone federal entity and his constant criticisms regarding their ties to Iran. As for Allawi himself, it is easy to contemplate his fate if he should sign up to the new alliance. The Iraqiyya movement would break apart – you just cannot fool all of the people all of the time. (In fact, this kind of outcome may well be exactly what the alliance leaders are hoping to achieve.) And even in the unlikely event that this trick succeeds among the Iraqi public, Allawi will likely end up as a disillusioned casualty of unbridgeable ideological divides, at best rewarded with a honorary ministry in the next Iraqi government. In short, the ascendancy of this kind of alliance would signify a return to the nonsense of 2003, a Paul Bremer logic with oversized, non-technocratic and corrupt governments in which each powerful player is accorded a ministerial vantage point from which to scavenge on the decaying Iraqi state. From the point of view of political maturation, there are in today’s Iraq two or three promising tendencies. The first is Prime Minister Nuri al-Maliki’s “State of Law” coalition. In contrast to the Iraqi National Alliance, it has ideological coherence, focused on the vision of a strongly centralised state and reversing some of the excessive concessions accorded to centrifugal forces in the post-2003 period – and it has tried to adhere to this programme during its coalition negotiations. The second is the remnants of the 22 July trend, which was instrumental in pushing forward many of the legislative projects that enabled Maliki’s emergence as a distinctive centralist in 2008, such as the provincial powers law and the provincial elections law. Today it survives for example in the Independent Nationalist Trend headed by Mahmud al-Mashhadani and Nadim al-Jabiri. Thirdly, there is the collection of newly empowered forces that came to the fore after the last local elections, again often on the basis of Iraqi nationalism and criticism of Kurdish expansionism. This has been seen among Arab and Turkmen politicians in Kirkuk and through the Hadba list in Mosul. The recently-declared alliance between Yusuf al-Habubi of Karbala and Ali Hatim al-Sulayman of Anbar – the “Flags of Iraq” – appeals to cross-sectarian and tribal sentiments in its iteration of Iraqi nationalism and could also be seen as belonging to this group of new constellations that involve new faces or people who have been out of government for many years. Ideologically speaking, both Allawi’s Iraqiyya list as well as the Hiwar movement of Salih al-Mutlak have a lot more in common with these forces than with the Iraqi National Alliance. For the sake of political maturation in Iraq and a concomitant move away from sectarian politics, it is to be hoped that these forces understand how they all need each other (and maybe Allawi’s flirtation with Hakim is just posturing intended to maximise his leverage in negotiations with Maliki). Unfortunately, there may be a tendency among Iraqi politicians to think that on their own they can repeat at the national level the “Habubi phenomenon” in Karbala (Habubi came from nowhere to win the greatest number of votes last January). What they forget is that those forces that were on the defensive in the last local elections have now devised their counter-strategy in the shape of the Iraqi National Alliance. It seems likely that another aspect of this counter-strategy is to make things as difficult as possible for Maliki in his ongoing negotiations with Iraqi nationalists – it is for example remarkable how media close to ISCI (which have been pushing the anti-Baathist and anti-Syria message for a long time) suddenly stand back a little while allowing Maliki to get trapped by going so strongly after Damascus. Nevertheless, with his greater degree of ideological consistency Maliki should still be taken seriously by forces eager to consolidate the signs of improved political atmosphere in Iraq seen over the past year or so. Maliki’s declaration today that the State of Law coalition will run separately and not as part of any other alliance is the clearest indication yet that he will not join the Iraqi National Alliance. However, the key question remains, namely, what will be the exact composition of the Maliki alliance? On this issue we are still waiting for a formal announcement, expected in the near future. Until it materialises, the flurry of contradictive statements and rumours concerning possible alliances (and now also super-alliances between coalitions) is likely to remain essentially a non-story. This entry was posted on Monday, 21 September 2009 13:52 at 13:52	and is filed under Iraqi constitutional issues, Iraqi nationalism, UIA dynamics. You can follow any responses to this entry through the RSS 2.0 feed. Both comments and pings are currently closed. Is it fair to describe Iraqi politics as dominated by two dichotomies: Islamist Anti-Baathism (Sectarian-Secular) and Cenralism-Federalism? The problem is the Islamist camp is hiding behind a veneer of secularism. I think the biggest problem of the “political maturation” camp is leadership: there is too many chiefs and not enough Indians. Faisal, by bringing up the maturation dimension I simply meant to make a plea for issue-based politics – in fact, any real political issue, instead of the complete opportunism of the Iraqi National Alliance as reflected in its bland and contradictive programme and internal composition. To my mind, consistency on the centralism-federalism dichotomy is better than no consistency and all, and I would also say that when it comes to secularism/Islamism, Maliki is closer to being consistent than ISCI, some of whose leaders try to feign secularism when talking to Western diplomats whilst their own grassroots politicians go about imposing Islamic dress code in places like Basra. Maliki wants to “impose the law” that is adopted by the Iraqi parliament; the problem is just that some of his local councillors are becoming a little zealous in devising special arrangements for certain areas (for example the wholesale closure of restaurants in Baghdad during Ramadan, and the ban on alcohol in Basra). It should be added that when it comes to the secularism/Islamism dichotomy it is not only the Islamists that are dishonest; the Kurds have signed up to a constitution which in practice means that no legislation contradicting Islam can be passed in Kurdistan and it will be for the federal court to decide the fine line between Islamic and democratic imperatives in the constitution. Personally, I don’t find it pathological at all that Iraqis use these elections to ask very basic questions about the fundamental nature of the Iraqi state and constitutional issues. These are questions that were swept under the carpet in 2005, so there is every reason to make the next elections into a contest about what political party can fix the Iraqi political system. These days, everyone speaks in the name of Iraqi nationalism (and say “no to sectarianism” and “no to muhasasa” etc. ), but on specific issues like centralism/federalism, Kirkuk, and oil policy it should be possible to elicit more specific answers. Given that Iraq is an oil economy, many issues that are prominent in the politics of other countries (tax questions, the role of the state in the economy etc.) are likely to remain less important in Iraq simply because there is going to be more consensus on them. A good signal of the progress of “maturation” will be if all parties endorse their candidate for prime minister BEFORE going into the election campaign. That is the way the issues will then start to be ventilated, via the robust Iraqi media and probably televised debates between the leaders. Western media and pundits would find such a process much more familiar and might lose their habit of treating the Iraq consensual democracy like a sinister “other”. Seeems fairly obvious that Maliki is demanding that he be endorsed as the prospective pm by the INA and demanding sufficient numbers on the list to ensure that would happen. The shia parties take a grave risk if they contest the election separately. Both INA and Maliki need extra components to ensure they have a reasonable possibility of winning the plurality necessary to earn the right to nominate the pm and cabinet. Hence the negotiations with Allawi. His lot got about 8% in 2005. Reidar, Yes, I agree that maturation may be measured as a consistency along the line of centralism-federalism, it is how many democracies work. And your point taken regarding deliberate blurring of the secularism-Islamism positions; there is such a backlash against sectarianism that nobody can defend it with a loud voice anymore. I see a possible developing parallel between Iran and Iraq’s politics; could the conservative-liberal divide in the last Iranian elections be developing in Iraq? Could Maliki or Allawi become Iraq’s Mir Hussein Mousawi? Not if they joins the INA, I know! It would be nice to have a strong quasi-liberal block but I don’t see it happening without UN run elections. You are apparently not aware that the UN and international monitors have been part of every Iraqi election since 2003?! Also, Iran’s political system from 1979 has always had a democratic component, but does not have proportional representation as Iraq does. On top of that Iran, vests final power in the clerics, whereas currently in Iraq final power is vested in the parliament provided there is a a two thirds majority. That’s my understanding, anyway, no doubt Reidar will correct if am wrong. My point is, the current divide in Iran is not between conservatives and liberals within a democratic constitution, like Iraq’s, but between anti democratic fundamentalist Islamists using increasingly totalitarian means to put down those who who have been putting their faith in the “republican” component of the Islamic Republic of Iran as established by Ayatollah Khomenei. Find it very difficult to see any parallel with Iraq? There are of course many factions and individuals who would promote ideology similiar to the Iranian Islamic fundamentalists, but there is no evidence they are anywhere near commanding a majority in the Iraq parliament or even in the makeup of its government, now or in immediate future? Quite the reverse, I would have thought? Bb, to the best of my knowledge, so far the UN elections-observation activities in Iraq have been fairly limited and in terms of monitoring have not really amounted to anything beyond rubber-stamping, although there has been much technical assistance. The international involvement is a lot heavier in Afghanistan where foreign nationals are actually part of the complaints commission. As for the comparisons with Iran, I keep coming back to the point that the supposed difference between the allegedly “apolitical” Shiite clergy of Iraq and the “Khomeinist” clergy of Iran is somewhat exaggerated, especially among Iranian oppositionists who look to Najaf for inspiration. Rather than being a dichotomy, this seems to me like a continuum where Khamenei and Khoei are just extreme poles and in between there are lots of intermediate positions that also involve clerical authority in politics, albeit with a weaker or different degree of institutionalisation than in the current incarnation of wilayat al-faqih in Iran. Both Muntaziri and Sistani are found somewhere along this continuum, and, it has to be added, so is probably Mir Hussein Musawi. Formally speaking, the principal limit to democracy in Iran is the all-powerful faqih/rahbar office. However, we need to remember that there is a potential in the Iraqi constitution for something almost equally powerful in the shape of the federal supreme court that will exercise judicial review to ensure that all legislation passed in the country is in conformity with Islam (and with “democracy” for that matter – the point being that it is for the court and not anyone else to sort out this contradiction). Of course, just how powerful and effective this body eventually will become won’t be known until after the required legislation is passed (with a two-thirds majority in the parliament), but the theoretical potential is certainly there. Having said all that, the Daawa party remains interesting in this discussion, not least because the party in the past has been reluctant to align itself as a movement with a particular Shiite cleric but instead has stressed the individual nature of the choice of a mujtahid cleric to follow. For that reason, we can speculate that they may perhaps be more reluctant than ISCI and the Sadrists to support a supreme federal court with a clear clerical majority, and as such in a better position to reach compromise with secularists on this issue. Finally, with regard to the headline of this post, there have been some rumours on the internet to the effect that a deal between Allawi and ISCI is already a reality. There is nothing to suggest that this is the case; in a guessing game where all the possible combinations of players now have been exhausted what we are waiting for when it comes to alliances is a formal announcement, which is more likely to emerge in full public, Baghdad daytime, after the Eid (which ends today although in some parts of Iraq government offices will remain shut till after the weekend), and with confirmation by all the main media close to the parties involved. What do you mean with Kurdish expansionism? Who are the good an bad guys Mr. Visser? Who did Halabja poison gas attack? Who did cleanse Kirkuk,Ninewe and Dyala province from Kurds,Turkmen,Shites and Assyrian peoples? Thank you in advance and I hope that you will keep your neutrality and objectivity, ALWAYS!!! Rasti, to criticize the policies of KDP and PUK since 2003 is not the same as denying the horrible suffering of the Kurdish people through history. Rather, this is about making the point that it will not solve the problem if the victim becomes the offender. Just like in the case of Israel and the Palestinians, one can recognise the terrible crimes committed against the Jews through history, mostly by Europeans by the way, without condoning the policies of the current Israeli administration. I am critical of the “Kurdistan über alles” line adopted by the two biggest Kurdish parties (especially the quest to identify “disputed territories” wherever Kurds live); to my mind this reflects a very primitive form of race-oriented nationalism that would present enormous problems to the region and the world if it were to become prevalent in the twenty-first century. We tried this before at Versailles in 1919 and it did not work out well. With respect to the past, there is of course no way the regime atrocities against civilians can possibly be excused. I would however like to add that it is often forgotten that the enmity between the Kurdish parties and Baghdad was aggravated when the Kurds joined the Iranians during the war in the 1980s. If we look at twentieth-century Iraqi history more generally, there is nothing to suggest that the conflict between the Kurds and Baghdad is fundamentally irreconcilable. Also, I think we need to realise that the Baath is part of Iraq’s past and Islam is going to be part of its future, one way or another. To my mind, the parties in the 22 July trend take a far more realistic approach to this than the extremists on either side, be they ultra-secularists or Islamic radicals. Many good people who lived in Iraq in the 1980s and the 1990s had to find some kind of accommodation with the Baathists in order to survive, and the way some of the “whiter than white” Shiite Islamist exiles frame their anti-Baathist discourse as a battle between Sunnis and Shiites is simply a distortion of reality: It was for example mainly pro-Baathist Shiite tribes who crushed the 1991 Shiite rebellion. Unfortunately, this kind of discourse has become dominant in Iraq post-2003, as reflected for example in the somewhat hypocritical anti-Baathist rhetoric of some of the Sadrists (who in fact have many ex-Baathists in their own ranks). But, there are also other Sadrists who take a far more realistic approach; these were at one point involved in the 22 July trend – and are today even celebrated by hardline Baathists in exile! Thus thankfully, in both cases, i.e. the Kurdish issue and the secularism/Islamism divide, there remains a good deal of potential for rapprochement as long as we avoid black and white stereotypes. I am aware of UN and International monitors in Iraq and I can prove it! With Reidar’s permission, I would like to refer you to my own blog entry on Aug. 9, 2009, (www.montrealiraqi.com) where I observed that such monitors did not have the mandate to examine vote rigging; a particularly bad type of fraud with the possibility of counting millions of fraudulent votes. I agree with you and with Reidar regarding Mousavi, who has a shady past and may not be described as liberal or democratic, but this only goes to show that the battle against fraud is not between Sunnis and Shias, or Arabs and Kurds, it is for the credibility of the political process for whatever the voters chose, even if they vote for sectarianism. As for the parallels between Iraq and Iran, I was driving at a rare opportunity for Iraq at its present state to influence the outcome of Iranian politics. If Maliki chose to identify with Mousavi and won the election then this will strengthen the Iranian reformist current, on the other hand perhaps it is precisely this dynamic which drives the increasing pressure to make Maliki join the INA. I think that you miss the MOST important issue in Iraqi politics, that is that most of Iraqi parties(except the Communist party) only accept Kurdish,Turkmen and Assyrian peoples as 2nd class citizens(This is also the case in the Shite-Sunni divide). That is the real tragedy. And that is why in the next 20 years Iraq(Made by the UK divide and rule policy) will be divided in several states(Finally!!!). Rasti, I agree that there are many problems in Iraq but the “second-class citizenship” dimension you refer to just isn’t one I have come across as a major issue. Surely, Kurds, Turkmens and Christians including Assyrians have been promoted to top positions within many of the political parties you condemn? Names that come to mind include Abbas al-Bayati (Turkmen, UIA), Bayan Jabr (Turkmen, ISCI) and Ali Baban (Kurd, ex-Tawafuq, still a minister in the Maliki government). Hunayn al-Qaddo (Shabak) has been influential within the UIA, and if I remember correctly the Hadba list in Mosul has promoted at least one Kurd to a leading position. Since the time of the Baath, Christians have held important positions in the military. In my experience, frankly, Iraqis with minority backgrounds are rather more fearful of Kurdish dominance (and, in some cases, Christians that are non-Nestorians object to being called “Assyrians”), than of Iraqi nationalism, which historically was a springboard for many to break free from insular sectarian groups. Just like the ICP, which you mention, the Baath attracted many minorities. As for partition, I must confess that after having worked on this issue for a decade and a half my main problem is that apart from Kurdistan, I am still unable to understand what sort of name should be given to any other breakaway pieces of Iraq. Iraqi nationalism has much deeper historical roots than people tend to give it credit for, and I think it is the return to this trend we have witnessed in Iraq over the past year or so. Could you name 1 Arab politician(in Iraq or the Middle east) that speaks Kurdish,Turkmen or Assyrian? I don’t want to sound racist, but it is a SAD thruth. Cannot think of anyone right now although I am sure they exist: Still in the late 1920s parts of the upper class in Baghdad were so Ottomanised that they had a hard time speaking proper Arabic! There is of course in this period also the case of Sati al-Husri, the famous Arab nationalist whose Turkish was in fact superior to his Arabic, which similarly illustrates how Iraq historically has been a meeting point of civilisations more than anything else. But more importantly, I find the issue you raise to be somewhat besides the point. For example, I cannot name a single Norwegian politician that can speak the language of the Sami minority that lives in northern Norway either, but I don’t think that is a reason Norway as a country should file for moral bankruptcy. And hence I just don’t see the link to your “second-class citizenship” claim. Thanks R. It’s that two thirds majority requirement that to me has always been the significant aspect. When you put this together with proportional representation, it follows that In Iraq crucial issues can only be decided with overwhelming support right across the political spectrum. If this support can’t be mustered, then the status quo remains.In my mind this plays into the way the tribes used to negotiate issues, absent the final resort to violence option, of course? Because of the two-thirds requirement it is highly likely that the supreme court will be given powers to impose, for instance, sharia law, simply because the Kurdish, secular and moderate religious parties would not support it. Re the UN and international monitors: it is my clear recollection that after every election there have been allegations of vote rigging, fraud, blah blah, then the monitors have finally reported, adjudicated or whatever, the fuss has then died down and the results by and large, accepted. Party list proportional representation is the most transparent of all systems and the most difficult to rig. Alot of commentators and commenters do not realise this. Furthermore, the results can be easily measured against the results of previous elections, and if we do that in Iraq we find that the proportions have remained consistent. For instance, it was v illuminating to see how the proportions adjusted in December 2005 when the Sunni parties participated. Also, thanks for clarifying Iraqqiya. FYI the two-thids requirement is an exception to the rule, i.e. it applies only to the special law for the formation of the constitutional court. Other than that, supermajorities are not required apart from constitutional changes. Also, the requirement that the president be elected on a single list with two vice presidents and a two-thirds majority was only valid for the first parliamentary cycle. It expires on 15 January 2010 and hence politics in Iraq can potentially become more majoritarian starting with the next parliament. It’s the constitutional issues that are usually the “crucial” ones! How about the two-thirds majority requirement for legislation that has been returned to the parliament after being vetoed by one of the presidential council? Regarding the presidents/vice presidents: even if they are elected by a simple majority, because of proportional representation it is likely they will still be composed of representatives of the governing coalition, so I suspect the status quo will be maintained. btw, I should have also mentioned the THIRD component, besides PR and ultimate power vested in the parliament, that distiguishes Iraq from Iran and Afghanistan, and that is Iraq has a parliamentary system with a prime minister, not a presidential system. We have seen very recently how easy it is to rig presidential elections or, in the case of Iran, how to fabricate the results entirely. This is simply not possible in Iraq, because of its party list PR voting system. Its actually a third-fifths requirement (for once-vetoed bills), and again, the presidential council expires in three months’ time. It was a one-off solution adopted for the first parliamentary cycle only, after which Iraq will have a single president without this special veto. Didn’t realise the two vice pres positions along with their vetoes were subject to phase out after five years? Why hasn’t this been made clear before, given all the accusations of the “sectarianism” of the set up? All the time it was nothing more than a transitional measure? Everything is spelt out clearly in the Iraqi constitution, but the idea about the “permanent Kurdish veto” is just one of those hard-dying clichés that keep getting repeated ad nauseam in the international press and elsewhere in the blogosphere. The sectarianism accusation relates to the way these provisions have been allowed to obstruct the legislative process during a crucial period of transition, and predictably there have actually been attempts by some of the parties to have the system perpetuated – although this now seems to have been unsuccesful. Thank R, but it doesn’t answer my point: why is that Iraq’s tripartite presidency has continually been cited as evidence of sectarianism (by yourself and others) without being qualified with the information that the tri partite presidency was subject to a sunset clause by the framers of the Iraq consitution? I’m sure you understand – without the qualification one is left with the impression that the constitution itself or the shiite and kurdish parties themselves deliberately enshrined sectarianism per se. But WITH the qualification an entirely different perspective is introduced: that is, that the tripartite presidency was established as a confidence building measure for the first term of the parliament/government and was never intended to be permanent. A serious omission, I would suggest, given that you are regarded, quite rightly, in the blogosphere as an authority on Iraqi shia politics? Well it has existed for four long years and on several occasions has been employed to derail or delay useful legislation (provincial powers law and provincial elections law are examples that come to mind) and has probably forestalled other legislative projects deemed certain to be killed in the presidential council. Some of the parties that benefitted from it also tried to prolong it. The two vice premiers belong to the same category. Then there are the sectarian quotas inspired by the frequent references in the constitution to “all the components of the Iraqi people” as seen for example in the constitutional revision committee. All in all this is a lot of sectarian quotas in key institutions of government as I see it. Once one knows that the tripartite presidency was a temporary measure almost certainly for the purpose of confidence-building, it can be argued that the presence of the Sunni arab Veep with power of veto (but ultimately subject to the parliament) had a considerable influence on reconciling the Sunni arabs to the new democratic Iraq political system. Of course the powers have been used from time to time, why wouldn’t they be?, but the effect has been to put off legislation or to have it amended, ie negotiation, compromise and backburnering until positions become reconciliable. Consensus democracy in progress, but you know that better than I! Personally I take the phrase “all components of the Iraqi people” as relaying a confidence-building unity message and an implicit guarantee that decisions will not be imposed via “winner take all” as Iraqis were accustomed under the Baath. If this has led to “sectarian quotas” in institutions that is more a sign of the infancy of a new system which is already maturing. Moving along, Reidar, if the Veeps go, how is the president elected — by a simple majority of the parliament? Does the president retain a right of veto? If so, can the veto be over-ridden by the parliament, and by what majority? BB, I certainly understand this interpretation makes sense to you, but the problem is that your basic axiom, i.e. that citizens feel that their concerns are best served through guarantees defined in sectarian terms, does not resonate with the Iraqi way of thinking, where such quotas are despised (they refer contemptuously to Lebanon for their much greater degree of formal sectarianism for example). Accordingly, most Sunnis would much prefer to have the idea of federalism south of Kurdistan totally erased from the constitution rather than any number of Sunni vice presidents. Please note also that the vetoes have been used to serve party interests (ISCI/KDP/PUK) and not communitarian ones, especially in the case of the provincial powers law where the basic idea was to prevent bothersome elections. From 2010 Iraq has only one president without the veto and s/he can be elected with a simple majority if a two-thirds majority is not achieved in the first attempt. You can find all the details in the constitution. I think we have strayed quite far from the original theme of coalitions now so let’s close this thread and continue the discussion elsewhere!